A devastating fire ravaged a garment shop at Kokila in Assam’s Bongaigaon district early Tuesday morning. 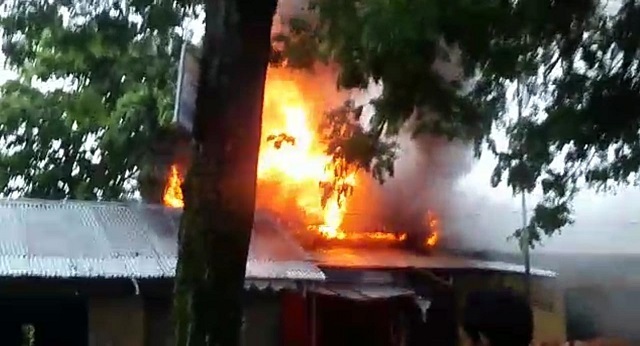 The inferno believed to have been caused by electric short circuit at a garment shop in front of Sakla Jame Masjid under Kokila police station in Bongaigaon district of Assam. The ravaging inferno ravaged at least three shops in the locality. Apart from the garment shop, another stationery shop and a shop dealing with computers were completely reduced to ashes. Several valuables like refrigerators, high-powered batteries, computers and Photostat machines were also damaged in the fire. The power connection of the nearby mosque and other residences were also affected in the devastating fire. Preliminary assessments have estimated that the inferno has caused damages worth around Rs 35 lakhs. The inferno was later brought under control by fire services personnel with the help of locals.